Are you looking for a solution to perform specific tasks when a USB drive is connected to your machine? Moreover, do you want to have dedicated tasks which only executed on selected USB drive when it is connected? Task Scheduler: How to automatically synchronize my USB flash drive? In general, task scheduler or power shell is the most common solution to perform a dedicated task when USB drive in connected. However, setting up these task is usually not easy. On the other hand, there are some commercial software which allow you to perform dedicated task with USB Drive, Safely Remove is one of the tool available in the market which allow you to perform specific task when USB drive is connected. But, this application is created just for this purpose. With Remote Scheduler, you can manage multiple scheduled task for USB drive which will be executed when the drive is connected using the USB Monitoring Task. Moreover, you can assign specific task only to a dedicated USB drive. Setting up a scheduled task for USB drive had never been so easy. An example above shows a script to sync files between USB drive and local hard disk using Robocopy which executed when USB drive is connected. The script can be downloaded from GitHub. The connected drive name (e.g: G:\ or F:\) where the USB drive is attached can be easily passed over to your script using the <Trigger.DriveName> parameter. Assign task to specific USB stick. 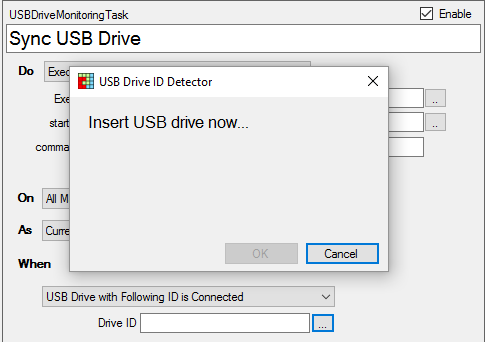 Use DriveID to assign task to only a dedicated USB stick. Don't worry, a built in wizard is available to help you to identify your drive ID. This is just one of the many features offered in Remote Scheduler. With this tool, you can easily deploy your scheduled task to multiple machines. Concern about security, you can have your script encrypted and only be able to executed on authorized machines. Try it yourself today. Should you have any questions, suggestion and recommendation. Feel free to contact us at codearteng@gmail.com.